Proteins are amazing molecular machines, but they occasionally need a little help. For instance, they often use specialized molecular tools when they need to move electrons from place to place. Iron-sulfur clusters are perfect for this task, since they form a unique delocalized system for storing an electron that may be tuned by the surrounding amino acids in a protein. Two types of clusters are particularly common: a square arrangement of two irons and two sulfurs, and a distorted cube composed of four irons and four sulfurs. Both are seen, for instance, in the electron transport chain of a bacterial respiratory complex I protein, shown here from PDB entry 3m9s. Cells have an elaborate set of machinery for building the proper iron-sulfur clusters for each job, and inserting them into their respective proteins. The proteins shown here are all part of one of the major systems found in bacteria, termed the ISC system. A similar system builds iron-sulfur clusters in our mitochondria. These seven proteins are found together in a operon that expresses the proteins when iron-sulfur clusters are needed. The IscR protein (PDB entry 4hf1) is involved in regulating this expression. The remaining proteins are involved with construction and delivery of the clusters. IscS (PDB entry 1p3w) has a desulfurase activity that extracts sulfur from cysteine and donates it to a growing iron-sulfur cluster, which is carried by the scaffold protein IscU (PDB entry 2z7e). 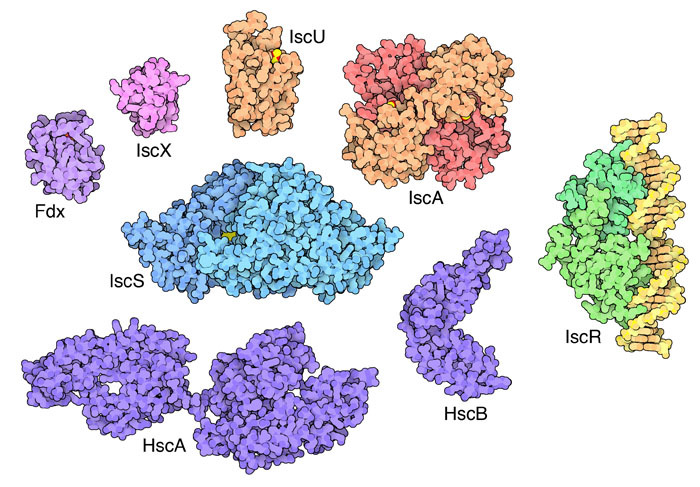 IscA (PDB entry 1x0g) also acts as a cluster-carrying scaffold protein. 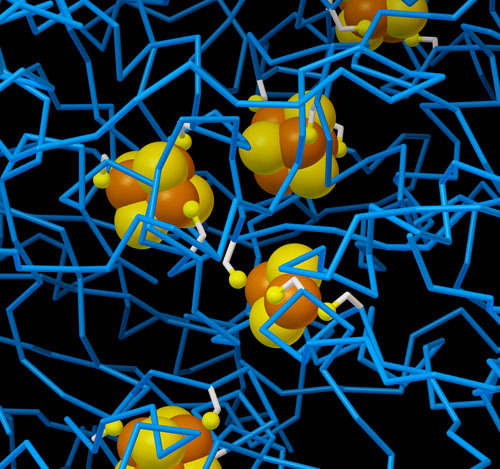 The source of the iron is still a subject of study, but recent work by PSI researchers at MPP has implicated IscX (PDB entry 1uj8) as a possible iron donor. Their work has also shown that IscX regulates the activity of IscS. The ferredoxin Fdx (PDB entry 1i7h) may provide electrons required for cluster assembly. Finally, two specialized protein chaperones, HscA and HscB, assist with the delivery of the completed clusters (PDB entries 2kho and 1fpo). PSI researchers have been using a variety of techniques, including SAXS, to determine how these protein interact. Their model of the ternary complex of IscS with IscX and IscU is shown here. PSI researchers have discovered that IscU is quite dynamic as it performs its job. In NMR experiments, they find that IscU adopts two different states when not bound to iron-sulfur clusters, each with a lifetime of about a second. They have observed some of these dynamics in two structures. At typical conditions found in cells, about 30% of the proteins are disordered and the rest have a defined structure, which was determined in an NMR experiment with the wild type protein (PDB entry 2l4x). 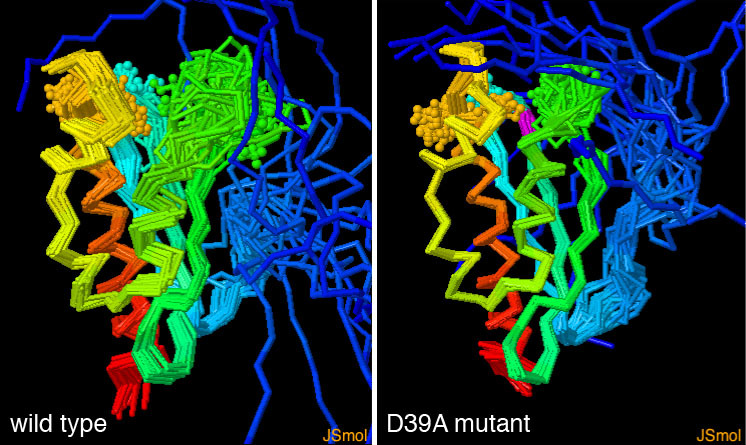 A mutant form that stabilizes the cluster-bound state shows less disorder (PDB entry 2kqk). To explore these structures and two metal-bound structures of IscU, the JSmol tab below displays an interactive JSmol. Kim, J. H., Bothe, J. R., Frederick, R. O., Holder, J. C. & Markley, J. L. Role of IscX in iron-sulfur cluster biogenesis in Escherichia coli. J. Am. Chem. Soc. 136, 7933-7942 (2014). Roche, B. et al. Iron/sulfur proteins biogenesis in prokaryotes: formation, regulation and diversity. Biochim Biophys Acta 1827, 455-469 (2013). 4hf1: Rajagopalan, S. et al. Studies of IscR reveal a unique mechanism for metal- dependent regulation of DNA binding specificity. Nat. Struct. Mol. Biol. 20, 740-747 (2013). 2l4x, 2kqk: Kim, J. H., Tonelli, M., Kim, T. & Markley, J. L. Three-dimensional structure and determinants of stability of the iron-sulfur cluster scaffold protein IscU from Escherichia coli. Biochemistry 51, 5557-5563 (2012). 3m9s: Efremov, R. G., Baradaran, R. & Sazanov, L. A. The architecture of respiratory complex I. Nature 465, 441-445 (2010). 2kho: Bertelsen, E. B., Chang, L., Gestwicki, J. E. & Zuiderweg, E. R. Solution conformation of wild-type E. coli Hsp70 (DnaK) chaperone complexed with ADP and substrate. Proc. Natl. Acad. Sci USA 106, 8471-8476 (2009). 2z7e: Shimomura, Y., Wada, K., Fukuyama, K. & Takahashi, Y. The asymmetric trimeric architecture of [2Fe-2S] IscU: implications for its scaffolding during iron-sulfur cluster biosynthesis. J. Mol. Biol. 383, 133-142 (2008). 1x0g: Morimoto, K. et al. The asymmetric IscA homodimer with an exposed [2Fe-2S] cluster suggests the structural basis of the Fe-S cluster biosynthetic scaffold. J. Mol. Biol. 360, 117-131 (2006). 1uj8: Shimomura, Y. Takahashi, Y., Kakuta, Y & Fukuyama, K. Crystal structure of Escherichia coli YfhJ protein, and member of the ISC machinery involved in assembly of iron-sulfur clusters. Proteins 60, 566-569 (2005). 1p3w: Cupp-Vickery, J. R., Urbina, H. & Vickery, L. E. Crystal structure of IscS, a cysteine desulfurase from Escherichia coli. J. Mol. Biol. 330, 1049-1059 (2003). 1i7h: Kakuta, Y., Horio, T., Takahashi, Y. & Fukuyama, K. Crystal structure of Escherichia coli Fdx, an adrenodoxin-type ferredoxin involved in the assembly of iron- sulfur clusters. Biochemistry 40, 11007-11012 (2001). 1fpo: Cupp-Vickery, J. R. & Vickery, L. E. Crystal structure of Hsc20, a J-type co- chaperone from Escherichia coli. J. Mol. Biol. 304, 835-845 (2000). Serrano, P., Geralt, M., Mohanty, B. & Wuthrich, K. Structural representative of the protein family PF14466 has a new fold and establishes links with the CD and PLAT domains from the widely distant Pfams PF00168 and PF01477. Prot. Sci. 22, 1000-1007 (2013).